Lacan’s Return to Antiquity is the first book devoted to the role of classical antiquity in Lacan’s work. Oliver Harris poses a question familiar from studies of Freud: what are Ancient Greece and Rome doing in a twentieth-century theory of psychology? In Lacan’s case, the issue has an additional edge, for he employs antiquity to demonstrate what is radically new about psychoanalysis. It is a tool with which to convey the revolutionary power of Freud’s ideas by digging down to the philosophical questions beneath them. It is through these questions that Lacan allies psychoanalysis with the pioneering intellectual developments of his time in anthropology, philosophy, art and literature. Harris begins by considering the role of Plato and Socrates in Lacan’s conflicted thoughts on teaching, writing and the process of becoming an intellectual icon. In doing so, he provides a way into considering the uniquely challenging nature of the Lacanian texts themselves, and the live performances behind them. Two central chapters explore when and why myth is drawn upon in psychoanalysis, its threat to the discipline’s scientific aspirations, and Lacan’s embrace of its expressive potential. The final chapters explore Lacan’s defence of tragedy and his return to Ovidian themes. These include the unwitting voyeurism of Actaeon, and the fate of Narcissus, a figure of tragic metamorphosis that Freud places at the heart of infantile development. Lacan’s Return to Antiquity brings to Lacan studies the close reading and cross-disciplinary research that has proved fruitful in understanding Freud’s invention of psychoanalysis. It will appeal to psychoanalysts and advanced students studying in the field, being of particular value to those interested in the roots of Lacanian concepts, the evolution of his thought, and the cultural context of his work. What emerges is a more nuanced, self-critical figure, a corrective to the reputation for dogmatism and obscurity that Lacan has attracted. In the process, new light is thrown on enduring controversies, from Lacan’s pronouncements on feminine sexuality to the opaque drama of the seminars themselves. Oliver Harris is a novelist and academic. He holds an MA in Shakespeare Studies from UCL, and a PhD on classical myth and psychoanalysis from the London Consortium (Birkbeck). He has taught at Birkbeck, London Metropolitan University and Cambridge Institute of Continuing Education. "Much like Freud, Lacan had a lifelong ‘compulsion for antiquity’, although in his case it was definitely more focused on hommelettes than on statuettes. In this brilliantly researched and masterfully written book, Oliver Harris explains why the study of Plato and Aristotle is as important for the development of Lacan’s thought as the reading of Freud himself, and he shows how key Lacanian notions cannot be fully understood without a return to classical antiquity. Avoiding the Bacchic frenzy that often accompanies the contemporary Lacan-cult, this book stands out as a new beacon, which will cast its light on the roots of Lacanian psychoanalysis for many years to come. "-Dany Nobus, Professor of Psychoanalytic Psychology and Pro-Vice-Chancellor, Brunel University London; Chair of the Freud Museum London. "This book makes a compelling case for returning, with Lacan, to antiquity, and by doing so Oliver Harris shows the reader how it is possible to open up and thereby also lay anew the foundations for an innovative reading of Lacanian psychoanalysis. 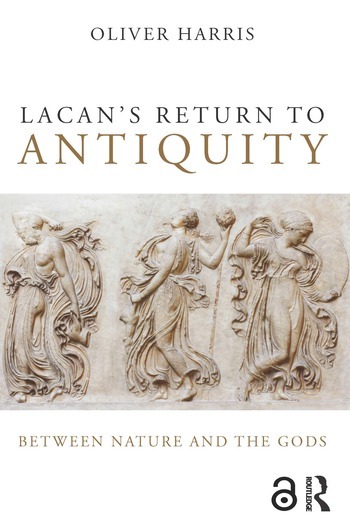 ‘Lacan’s Return to Antiquity’ accomplishes its task with clarity and energy, bringing a writer’s craft to bear on telling us what we should already have known, and thereby striking a conceptual blow après-coup for antiquity with Lacan. "-Ian Parker, Psychoanalyst, Professor of Management, University of Leicester, UK. "The exploration of Lacan’s engagement with the Classics sheds a novel and appealing light on his thinking. In this sparkling study, Oliver Harris shows how fruitful for Lacan’s ideas, no less than for Freud’s, were the writings of classical authors from the Presocratics and Plato to Plautus and Ovid. The deep-rooted connections of ancient myth, philosophy and literature with Lacan's insights into sexuality, creativity and fantasy allow Harris to present an original and engaging exploration of key texts for both psychoanalysis and the Classics. "-Dr Armand D’Angour, Associate Professor of Classics, Oxford University.